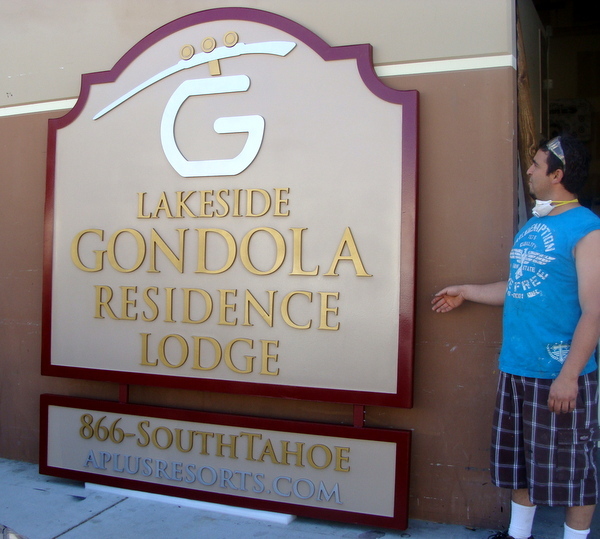 Above is shown a multi-layer entrance sign for the "Lakeside Gondola Residence Lodge". This attractive sign features cut-out text, border and art (stylized gondola) , and a smooth HDU surface . The art (gondola with a G) is cut-out of HDU in pieces and mounted on the signboard with epoxy and screws, Metallic gold paint is used on the letters. This attractive sign and similar ones can also be made of stained and painted wood. The sign is hand-painted , and then clear-coated, twice. This sign can be mounted on an outside wall, or hung from the ceiling or an iron hanger, or placed between two posts outside. You can return to the Gallery 29 (hotel, motel, inn and B&B signs ) page to see over 125 signs by clicking on "Return to List" below right.